The Grolier Club ---1915, Color Wood Engraving. Edition not stated. With the artist's monogram in the block, lower right. With linotype caption From "New York", The Grolier Club 1915 in the left and right margins. Image size 7 x 4 1/2 inches (178 x 114 mm); sheet size 10 1/2 x 8 5/16 inches (267 x 211 mm). A fine impression, with fresh colors, on cream wove paper; full margins (1 5/16 to 2 3/8 inches), in excellent condition. 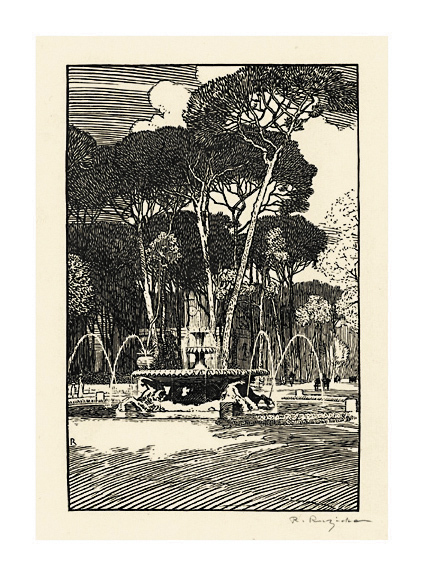 Fountain of Sea Horses, Rome ---c.1915, Wood Engraving. Edition not stated. Signed in pencil. Initialed in the block, lower left. Image size 5 3/8 x 3 7/16 inches (137 x 87 mm), sheet size 9 1/8 x 5 7/8 inches (232 x 149 mm). A fine impression, on cream wove paper, with full margins (7/8 to 2 3/8 inches), in excellent condition. 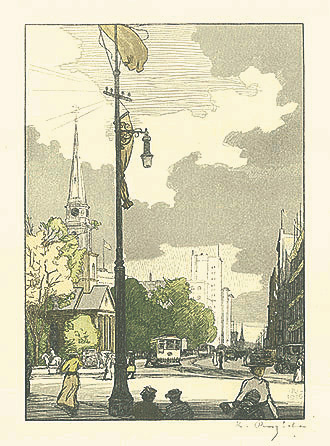 The Colleoni, Lincoln Park ---1916, Color Wood Engraving. Edition not stated. Signed in pencil. With the artist's monogram and date in the block, lower right. Image size 7 3/4 x 5 1/8 inches (197 x 130 mm); sheet size 12 x 8 7/8 inches (305 x 225 mm). A fine impression, with fresh colors, on cream laid paper; full margins (1 1/4 to 2 3/4 inches), in excellent condition. 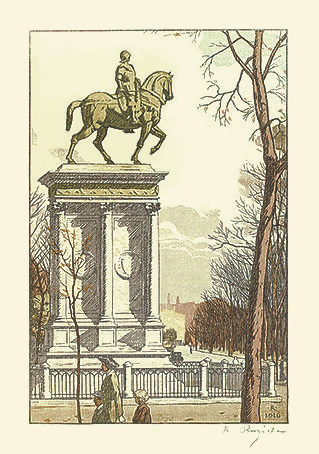 The First Church Burial Ground ---1916, Color Wood Engraving. Image size 7 9/16 x 5 5/16 inches (192 x 135 mm); sheet size 11 7/8 x 8 7/8 inches (302 x 225 mm). 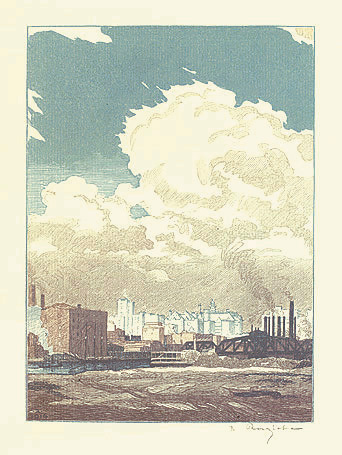 View of Newark from Harrison ---1916, Color Wood Engraving. Edition not stated. Signed in pencil. With the artist's monogram and date in the block, lower left. Image size 7 1/2 x 5 1/2 inches (191 x 140 mm); sheet size 11 7/8 x 9 inches (302 x 229 mm). A fine impression, with fresh colors, on cream laid paper; full margins (1 1/8 to 2 7/8 inches), in excellent condition. 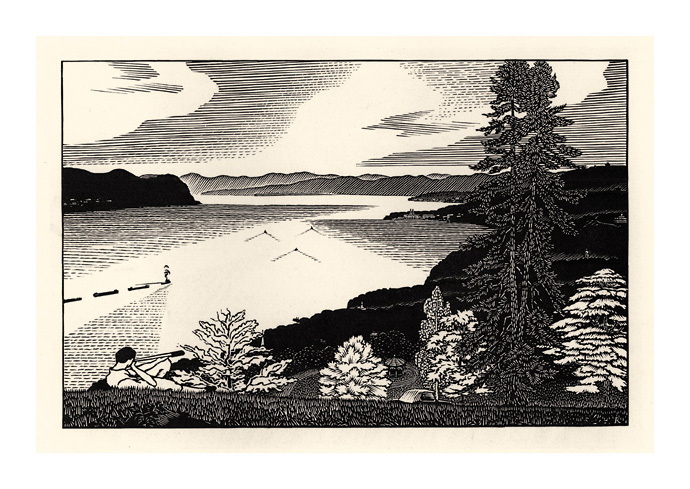 A Summer Day ---1936, Wood Engraving. Edition not stated. Initialed in the block, lower right. Image size 5 1/16 x 7 7/8 inches (129 x 200 mm), sheet size 13 x 18 inches (330 x 457 mm). A fine impression, on cream wove paper, with full margins (3 1/4 to 5 inches), in excellent condition. In the original American Artist’s Group mat. 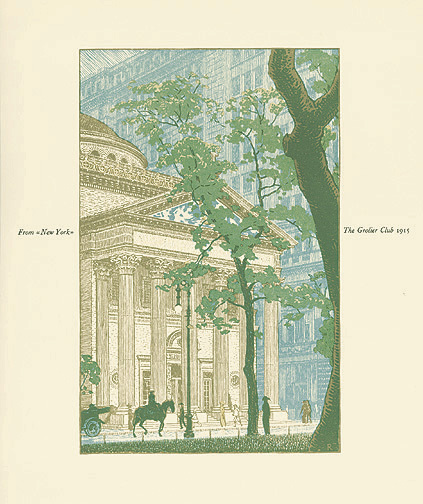 Published by American Artists Group in an unsigned, unlimited edition not exceeding 200, with their printed logo, lower left, verso.